Apparently, I did not think too far ahead with my goal setting, and I think that was a wise decision. Goal Two proved to be much less of a challenge than I expected, and I was very relieved by that (but was disappointed not to get a Team Singular Gryphon photo at the top as DK and I crested together). Goal Three also proved to be much more realistic than I had feared; however the sun was out in force and was putting Goal One in jeopardy! My relentless relationship with nausea was returning. 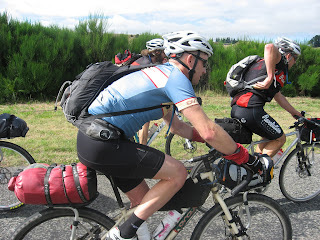 Luckily I seemed to be able to keep it slightly in control through a heavy reliance on Endurolytes and also, possibly, the large number of ginger tablets I was downing helped – I cannot be sure. Endurolytes, ginger and the occasional SeaLegs remained my theme for the next five days. 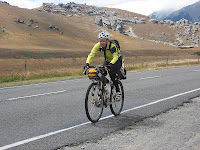 Thanks to Jonty's meltdown on Upcot Saddle I made it to the start of the Molesworth not too long after the rest of the Voodoo Lounge (Thanks again Jonty!). I was there around 3.20pm, with plenty of time to spare! 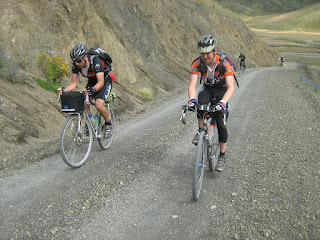 I took a slightly less luxurious stop than the rest of the guys and then managed one of of my small personal victories: I beat them all through the Molesworth! Waa Hooo! I had made it through on Day 1, albeit at 15 minutes past 7pm. The ranger did not seem to mind, however, and offered Peter and me a nice cup of tea while we waited for the rest of TVL. All of this and no vomiting; however, I was certainly pretty cooked. As would happen over and over in the next days, I did not try and stay with the guys on the ride in to Hanmer, and I think I even had a few choice words for Jefe when he tried to pull me back up to them. Despite that I got into Hanmer only a few minutes after them. I even managed to down some of my Thai tofu fried rice. All-in-all, not a bad start. 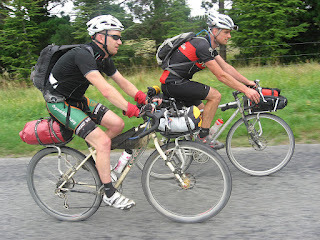 Day 2: Hanmer to Sheffield. I kept my goal to stay as long as possible with TVL, but to be careful and not to push my nausea over the edge. This seemed to work quite well and I was able to ride with them for much of the day and mostly kept them in sight through the relentless hills. I somehow managed to catch them again just before Lee's Valley and had a nice ride on the flat gravel road with what must have been a strong tail wind (which we had a lot of!). The Wharfedale. What happened?! I really enjoyed this single track in 2010. This time I was not having much fun! It got even worse when I realised I had lost my sunglasses somewhere on the track. Much to my amazement I made it through with TVL. They swear they did not wait.... We had hoped to make it into Sheffield in time to get some accommodation at the pub, but we had no such luck. Instead we found the best accommodation of the entire ride: The Hedgerow Hilton. Fantastic. 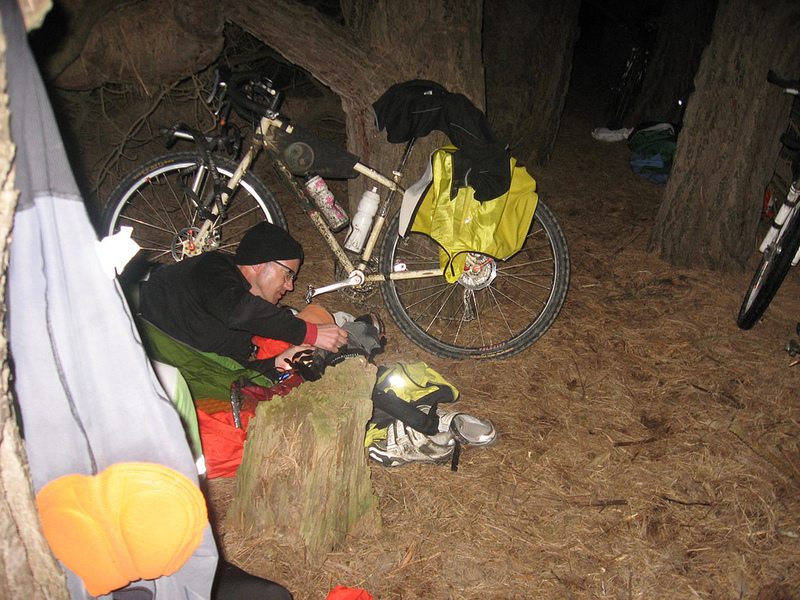 Who would have ever thought you could get 5 people and bikes inside a hedgerow and stay dry through a drizzly night? Once camp was set up I tried to down some canned apples, which had been my savior in the past. No such luck. My guts were wrecked. Ah well, at least my sleep was fantastic. 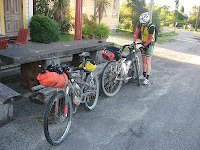 Day 3: Sheffield to Blackball. This day started out as the low point of the ride, and ended with a high point. I got down what food I could, which was pretty much nothing. Unfortunately, my nausea had not improved over night. A bottle or two of juice was about all I could handle. Time for the SeaLegs. Hopefully they would not wipe me out. 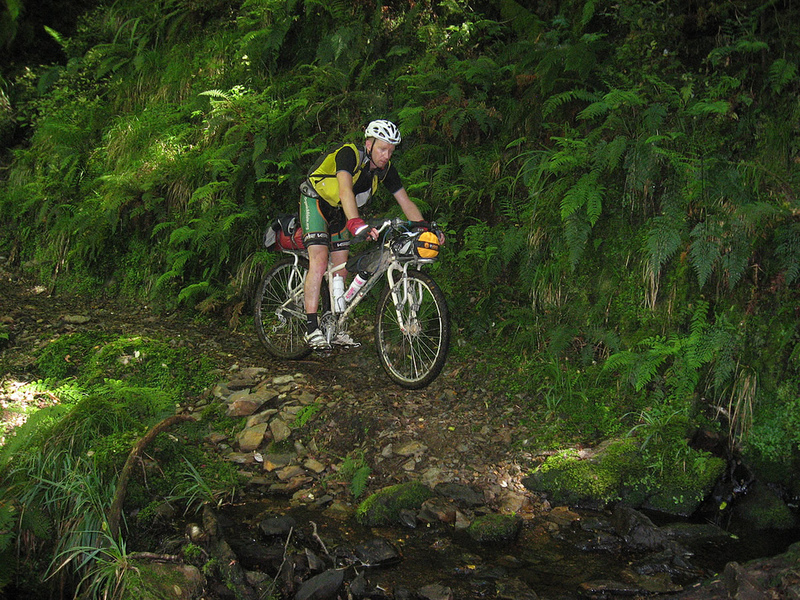 I had a bit of a head start to and up Porter's Pass, but unfortunately it only lasted a short while and TVL-with-no-Jonty passed me quickly. Jonty must have been up the road somehow. The sight of me “riding” up Porter's Pass must not have been pretty, but luckily I was mostly shrouded by drizzle and fog. Much to my enjoyment, the top came much before I expected. Wow. What a boost that was. After a bit of a descent down into the sun I saw the rest of TVL on the side of the road dealing with some bike issues. But hold-on, Jonty was not with them! He was behind me! Waaaa Hooo!! Small victory number two!! He took a wrong turn at the bottom and rode the wrong way. So I beat him. Up Porter's Pass. Fantastic. I did not care if he maybe rode it 30 minutes faster than me. I still beat him. I vowed right then to never forget it. Unfortunately, by this point it was clear that my replacement seat for my recently broken Arione Twin-Flex was a poor choice. Ouch. I have never had such bad chaffing (since Day one). I was also starting to get pins and needles in my glutes and lower back whenever I would sit down. So I did a lot of standing for the last 3 days. My left knee gave me a fair bit of grief in the first three days too. I was a bit concerned I might not be able to go on early on Day three, but it mostly went away later in the day. I have no idea why. Again I watched them ride away from me as we started going uphill. It did not worry me, at this point I was most happy riding on my own at my own pace. Again I met up with them at Arthur's Pass (they must have had another luxurious stop) and here I managed to finally get some food down again. After another coke stop at the Jackson's Pub, we were off onto the back roads to Blackball which had been a highlight for me last time. Again, it did not disappoint, and I really enjoyed this stretch and I finished the day out with TVL again. The Blackball Hilton was another highlight, with my stomach now slightly cooperating, I enjoyed one of the best sandwiches I have had – the gherkins really seemed to do the business. Thanks very much to the owners for going out of their way to make me a vegan meal well after their kitchen was closed. A bed and a shower were very welcome, and it was encouraging to see a good contingent of breveteers at the hotel and possibly only four were up the road. To top it all off, Nathan Mawkes had found my sunglasses on the Wharfedale and kindly gave them back to me! 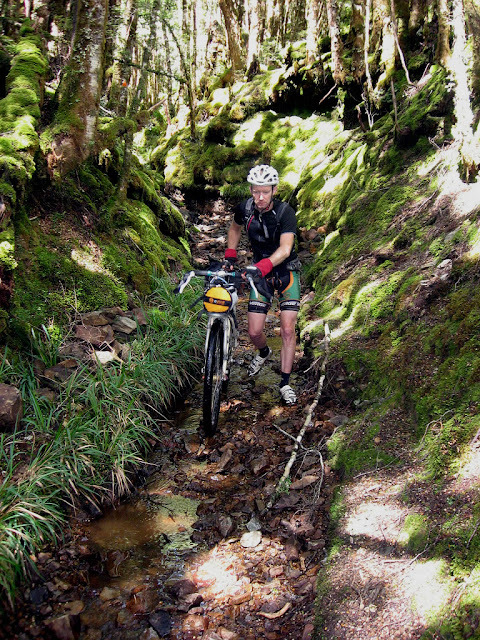 Day 4: Blackball to Murchison. I managed to get down what must have been about three tins worth of tinned fruit – a good start! 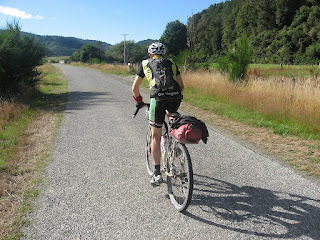 Jefe and I headed down the road before the others, knowing they would catch us up on the Waiuta/Big River track. On the down side, Andy K had come down with a bad case of stomach lurgy and was forced to start later in the day. The Waiuta/Big River was a completely different experience than the previous time. Waiuta required some walking due to mud, etc, but was generally a pretty relaxed experience. Big River on the other hand – ugh. Where did all of those nasty rocky steep climbs come from?!?! Unfortunately, they got the better of me and I lost the rest of TVL. However, we had picked up wrong-way-Thomas earlier in the day and he was having endless tire problems so there was always someone around. 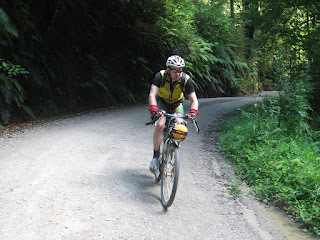 After a big fuel session in Reefton, I headed down the road ahead of the guys again and they caught me just as we started the climb. I managed to hang up for most of it and still had them in sight at the top. Whew, that was a pleasant change. Again, I had another enjoyable dusk & evening ride into Murchison – but it was quite a late night, getting in just about midnight. The last 30+ minutes I had ridden alone and really enjoyed it. I am not sure why. I was in no hurry to get to Murch and had just decided to cruise it alone. Something I did a lot of! 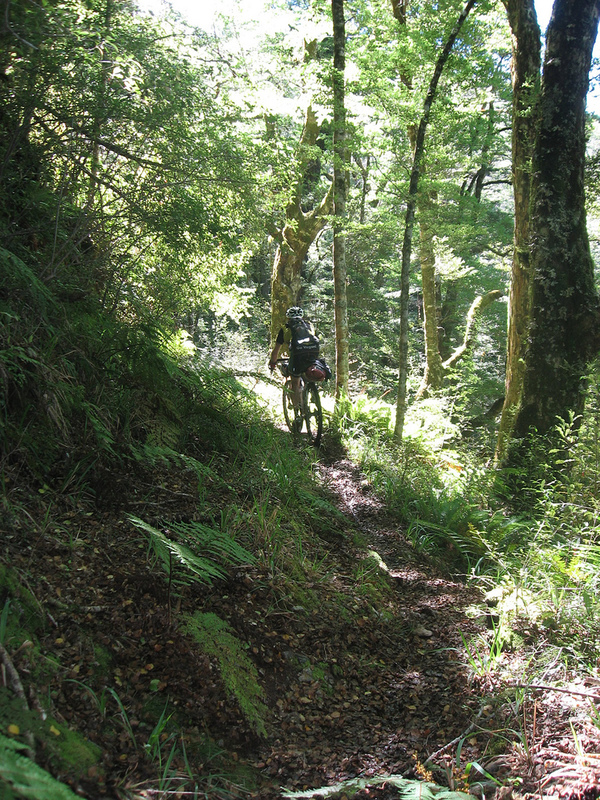 Day 5: Murchison to Pelorus Bridge. Uh oh. I had some concerns about this day. I think Jefe must have sensed that and he announced that he planned to smash it into the finish. Ah well, it had been good riding with them to this point. I was happy to go it alone. They intended to make it to the Pelorus Bridge campground and hopefully I would meet up with them there. Somewhere up the Braeburn I lost them and I would not see them again; I would just hear rumors of their presence in certain locations. The heat also started picking up again and my nausea was coming back strongly. So, after a short lunch stop at St. Arnaud I realised there was no sense in pushing it. I decided to take it easy and make sure I did not overheat. That meant a few stops under shady trees! Fortunately, that was the right decision. 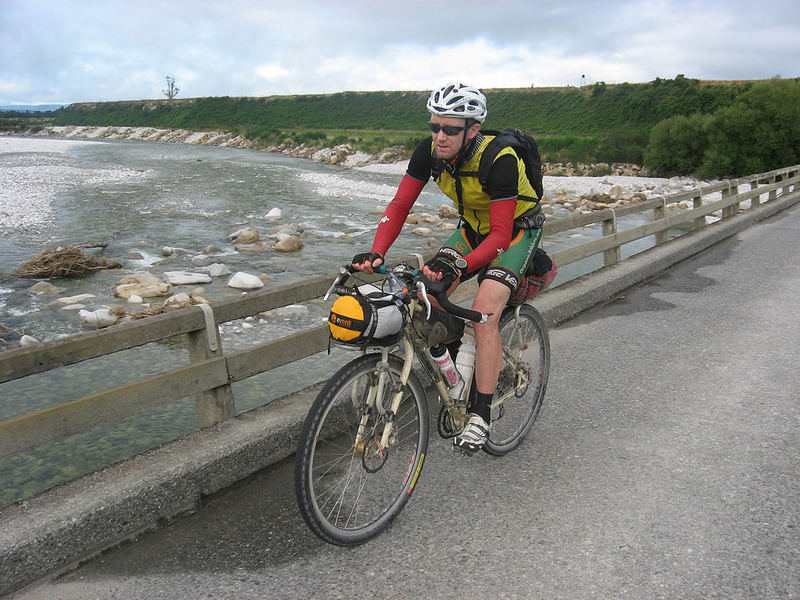 I think I made it to Nelson about 2 hours after the rest of TVL but my guts were in good shape. After a series of navigational disasters (@$%@$ Charlotte Lane!!) and a colossal amount of time wasting trying to find Subway, I did a serious amount of eating. It must have been just past 8 when I started heading up toward the Mangatapu and I was somehow looking forward to going over it alone and in the dark, but with a full moon. After freaking out the local publican with my shaking, while she kindly refilled my bottles, I was down the road. The Mangatapu did not disappoint me, but I did a bit more walking than I had anticipated. At the top I was very impressed to see someone had put a sign up in support of Team Voodoo Lounge! That was pretty spectacular and I got a good laugh and a boost from it. The sign with directions for wrong-way-Thomas was even better. I stopped and said a prayer for 2010-Matt at Murder's Rock and finally rolled into Pelorus Bridge at an obscenely late hour after a beautiful full moon descent down the valley – but those endless little climbs in the last few kms nearly did my head in!! Downhill, little farm house, climb, downhill, little farm house, climb. Over and over and over. I just wanted to be in my bivvy! I rode around in circles at Pelorus Bridge for at least 15 minutes looking for the TVL Encampment, but never managed to locate it. I imagined that they must have gone on to Havelock: something I was very tempted to do. However, the ranger informed me in the morning that TVL was indeed there and had just dumped their bivvies somewhere in the bush and not used the official campground. Sneaky buggers. I had ridden right by them. I pretty much ate everything I had left and managed a short nights sleep. 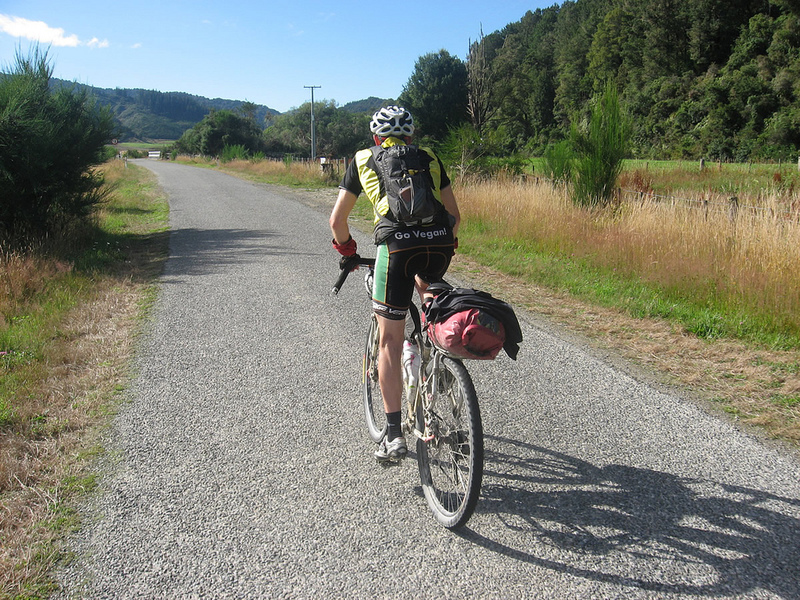 Day 6: Pelorus Bridge to Blenheim. One might be tempted to say that I took the “take it easy” motif a bit too much to heart on this day, and they would probably be correct. It was already hot early on and I was scared to death of another meltdown on Port Underwood, which had been my undoing in 2010. Havelock appeared much earlier than I expected and I had an enormous meal of baked beans on toast and assorted items and even my first coffee since Day 2. 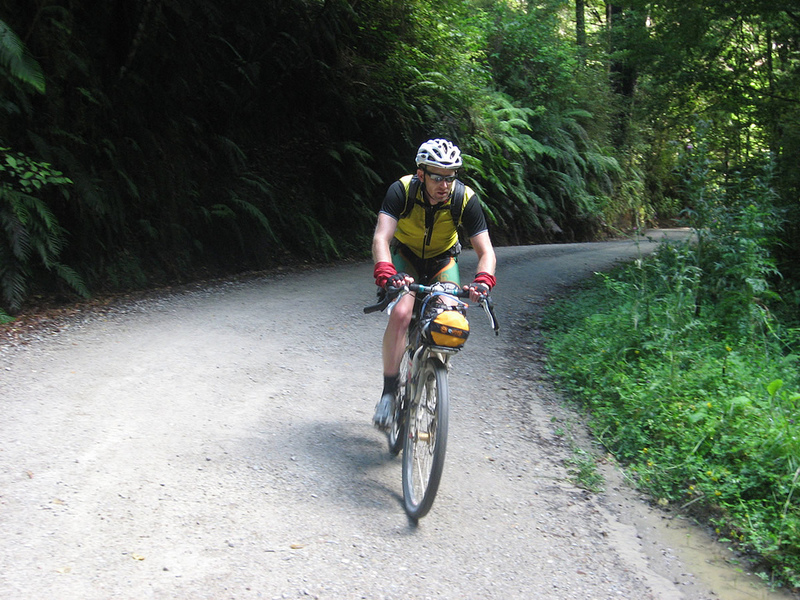 The ride from there to Picton is a beautiful and fun one, but the heat was bringing out all of the demons. I wanted to be able to eat normally in the days following the race, so I continued to take it easy in to Picton where I had another extra large serving of baked beans on toast, and some more coffee. A local stopped me at the cafe and said he had been following us online. That happened a few times during the ride and is quite a fun experience. 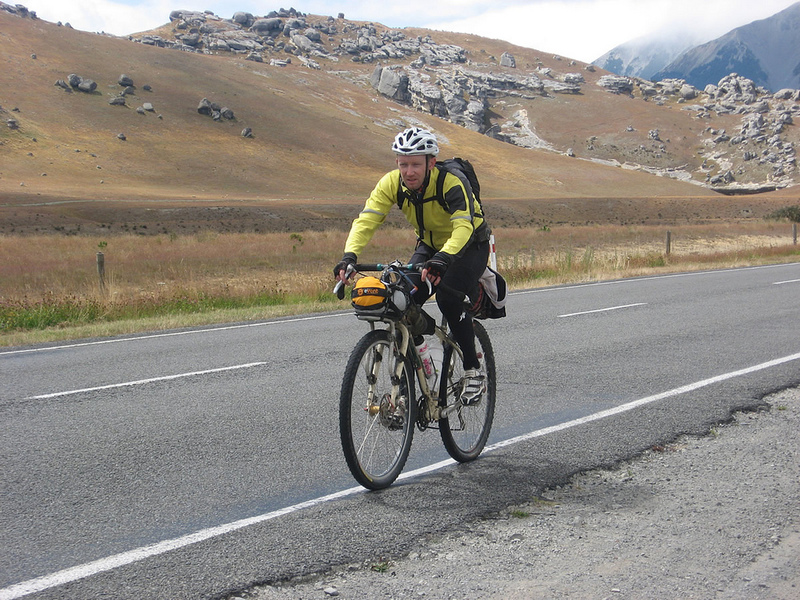 The temperatures continued to climb as I headed into the Port Underwood hills. At this point the “take it easy” theme really got the best of me. I almost regretted it when the David and Stephen the singlespeeders passed me about 1/2 way through – how'd I get ahead of them?! As expected, there were a few more hills than I remembered and I had really had enough by the time I hit the tar seal. Too bad the road kept going up. Once down on the flat I was helped along by what was mostly a strong tail wind and with much easier navigation than the previous finish!! Finally I was at the Square in 5 days and 9 hours – very relieved to be finished, but mostly just glad to not have to sit on that saddle. I suppose I should say I met all of my goals, even if I cannot remember one of them. However, I think the spirit of Goal One slightly eluded me, and next time I need to shoot for nausea-free! I am afraid that would require not starting, and that just may not be a possibility. Well done Matt! Sounds like a bit of a mission at times though. Do you mind sharing a bit of the back-story of the nausea? Is it exercise induced? Riding with Jefe makes me vomit! It only happens during exercise and I have been trying to conquer it for at least the last 16 years. I've worked with nutritionists and a variety of coaches, all with varied strategies and all without any real success. A sweat rate of 3L/hr in hot conditions certainly doesn't help things, and it typically only comes on past 6 or 7 hours. It also usually just happens during racing, so I am starting to believe that I am as messed up in my head as everyone tells me!